This is a blend of 69% Zinfandel, 18% Petite Sirah, 11% Carignane and 2% Mataro (also known as Mourvedre). 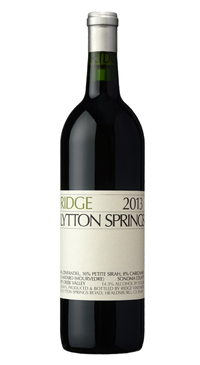 The grapes are sourced from the Lytton vineyard located in the Dry Creek Valley viticultural area in Sonoma County. The grapes are hand harvested and fermented with native yeasts. The Petite Sirah in this blend was whole berry fermented, while the other grapes were crushed ; all of the wine undergoes a natural malolactic fermentation. The wine spends 13 months resting in air dried French oak barrels of various ages; 20% new and the remainder older and used barrels as to not detract from the wine’s primary fresh fruit. Minimal sulfur usage and light pad filtering keep with the winery’s low intervention wine making methods.